It is hard to define national Israeli Food. With a population from very many different countries, every community contributes its own special foods and flavors. The Israeli breakfast is world renowned and it includes yoghurts, fruits, cheese, eggs and salads. The breakfast buffet also includes varieties of smoked fish; mackarel, herring and sometimes salmon. A selction of breakfast cereals and delicious baked goods, pancakes and Belgian waffles may also be served. Freshly squeezed fruit juice - mainly orange and grapefruit is popular. We've listed some of the most popular foods amongst local Israelis and there are probably three stand-out dishes that are considered Israel's national foods and tourists insist on eating them when visiting the country; felafel, schwarma and hummous. Freshly fried, golden balls of chickpeas blended with traditional Middle-Eastern spices served with salads in a pita; felafel is so popular that we've dedicated an entire article to its preparation and serving. Schwarma: finely sliced, grilled meat - turkey or lamb, grilled on a special schwarma rotisserie and packed into pita bread. Traditionally served with onions, parsley and tehina. It can also be served in a "lafa", a flat-bread resembling a large pancake. Hummous and Tehina:Hummous is a spread made from chickpeas and served with olive oil and pita. Tehina is a dip made from sesame seeds. Eaten together they are a complete protein. 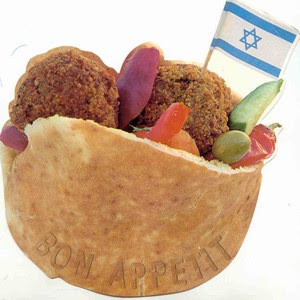 In a restuarant your order of hummous will probably be served with a variety of pickled vegetables (Heb: hamutzim) and olives. Israelis love hot French fries (known locally as chips). Not all restaurants serve chips with a steak or burger and you may need to order them separately. Ketchup is the most common accompaniment to hot chips. If you enjoy mayonnaise or vinegar with yours, you'll have to ask your waiter for some. The traditional Israeli vegetable salad is made of very finely diced tomatoes and cucumber served with a lemon juice and olive oil dressing. Haloumi, Nicoise, quinoa and every other type of popular salads are available in local restaurants. Portions are large and are easily enough for two people. Boerekas ares mall savory pastries filled with cheese, potatoes, spinach or mushrooms. Often eaten with hard-boiled eggs and a pickled cucumber. Boerekas are eaten for breakfast, lunch or dinner. They are a popular street food. Shakshouka a breakfast food of poached eggs cooked in a tomato based sauce. Flavored with cumin, chili and parsley, there are many variations of this dish as you will see in our recipe selection. Kebab, traditionally a blend of finely minced lamb and herbs and spices, shaped like a sausage and grilled on the fire. Lamb is expensive in Israel, so our little trick is to add lamb fat (which can be bought at butchers and supermarkets) to beef or turkey - the fat imparts the unique flavor of lamb into the meat. Schnitzel from chicken or turkey breast, fried in breadcrumbs, is a very popular meal and children love it. Eaten on a plate and usually with side-serving of chips, it can also be served in a pocket of pita with hummous, tehina and salads. Israelis love steak but it is quite expensive. You can expect to pay upward of 100 shekels for a steak when you order it in a restaurant. The Sinta or sirloin and the Steak Ayin, the rib-eye steak are the most popular. Baklawa is a small, sweet cake made from phyllo pastry and nuts. Pistachio nuts are traditionally used but other nuts are sometimes used. Baklawa are popular across the Levant. About 1,000 calories a bite! Knafeh is a traditional Arab desert made with Ricotta cheese, shredded noodle-like pastry called 'Kadaif' and syrup. Expect to pay between 10 - 15 shekels for a single serving if you buy if from a market stall. Malt Beer is a black, non-alcoholic malt flavored, Israeli beverage. In Hebrew it is called "Bira Shechora" or black beer. Popular local brands of alcoholic beer are Maccabi and Goldstar. Well known international beer brands are readily available. The pub price for a local Israeli beer is about 25 shekels. Alcohol is sold in supermarkets and in specialized stores. The legal drinking age, in Israel, is 18. Tea with Nana is weak black tea served with Nana leaves (Eng: mint leaves) and sugar. Hot water infused with nana is also a popular and refreshing drink. When you order tea in a restaurant, you will be served a cup of boiling water and a tea bag on the side. No tea-pot and no milk! Another popular drink is fresh lemon juice mixed with sugar and nana and it's called 'limonana'. It is served ice-cold and is very refreshing in summer. Cafe Hafuch - literally upside down coffee - is very popular. Basically a long cappuccino, the milk is first heated and frothed and the coffee is then added. Turkish coffee - more commonly called Cafe Shachor (black coffee), is a small cup of strong, sweet coffee often flavored with cardamon and served at the end of a meal, around a campfire or just anywhere. Turkish coffee is traditionally prepared in a cone shaped coffee pot called a finjan. Garinim - seeds of all kinds; sunflower, pumpkin and watermelon are salted and roasted and eaten as a snack food anywhere, anytime. Roasted nuts like pistachios, almonds, cashews, pecans etc. are very popular too. Chestnuts are available in the winter months. In Hebrew, the collective name of these snack food is 'pitzuchim'. Dried fruits of all kinds are popular too and are readily available.